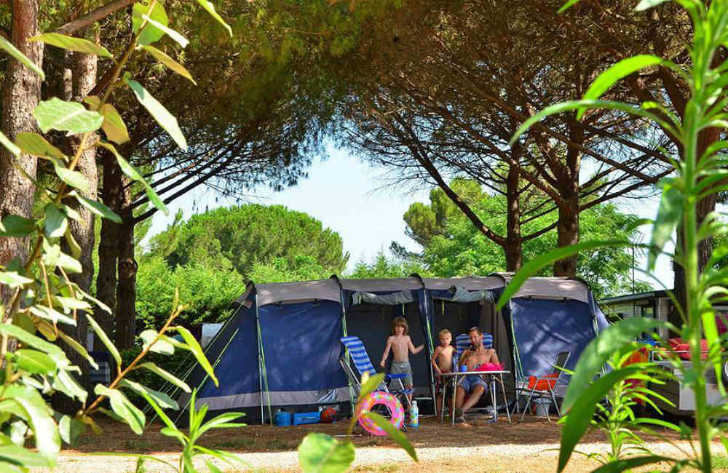 Camping in France in your own tent is popular with holiday makers from all over Europe. The most popular nations to go camping in France include the French, Germans, Dutch and of course those from the UK and Ireland. As camping has become more popular so have the number of campsites which now exceed 9000 in number. Most campsites offer accommodation that you can rent along with pitches for your own tent, caravan or motorhome. If you’re planning to go camping in France in your own tent, there are a number of questions that you may be considering. What are the campsite pitch sizes?, Which facilities do campsites have?, What size of tent do I need?, What to take camping?, How will I get to France? and most important of all Where to go camping? All of these questions need to be answered if you’re thinking of going camping in France in your own tent. Below you can find a number of suggestions to help you. What are the campsite pitch sizes? Before we answer this question we’ll start by saying that what makes the “PERFECT PITCH” for one doesn’t necessarily make it the perfect pitch for someone else. Camping pitch sizes vary massively depending upon the size of campsite and also its location. Quite often campsites near popular tourist areas or near the sea have slightly smaller pitch sizes. This is because they try and fit more pitches on. This is not however the same for all campsites. Many campsite owners have recognised this and now provide a variety of pitch sizes. Campsites located inland tend to have larger pitches due to the campsite grounds being bigger. Wherever you decide to book you need to remember that your tent, vehicle and outside space need to fit within the pitch boundaries. Some of the pitch sizes we’ve seen include 50m2-70m2, 70m2-90m2, 90m2-110m2 and even up to 130m2. Imagine getting to the campsite and finding out that your tent doesn’t fit! Which facilities do campsites have? Campsites come in all shapes and sizes and therefore the onsite facilities will vary greatly from campsite to campsite. The following facilities are common on the majority of campsites. Washing facilities – All sites provide wash basins, hot showers (normally free) and toilets. Disabled facilities – All campsite generally have disabled toilets and washing facilities. However some campsites won’t be completely disabled friendly. Electrical hook-ups – Electric hook-ups are dependant upon the pitch you rent on each campsite. Water and drainage – Some campsites have water and drainage on the pitch. This is normally stipulated on the pitch information when booking. Washing machines and dryers – Washers and dryers are available on the majority of larger campsites at a charge. Equipment hire – Additional equipment is available for a charge on many campsites. These include items such as fridge freezers, TV’s and patio furniture. What size of tent do I need? Well that’s a really tricky question that only you can answer but in general you need to consider the following. Firstly you need to look at the number of people in your group and the manufacturers guidelines. If your a family of four then ideally you need at least a 5 birth tent. Manufacturers are often a little tight on the amount of space they give so increase your berth by at least 1 person. Secondly you need to look at the size of the living space. If it does happen to rain when you are camping then you need to ensure you have enough space to keep you and your equipment dry. Thirdly don’t forget the pitch size. It’s no good you picking the largest tent you can find to discover that it won’t fit on the majority of campsites you’d like to visit. Take a look at some campsites that you fancy visiting before you get a tent and make sure it will fit. Finally don’t just look at floorspace, don’t forget to look at headroom. Do you really want to spend most of your time crouched over or would you rather be able to stand. This is a big question that we will cover in more depth in our “What to take camping?” blog article. There’s such a large amount of equipment that you may think you’ll need or want to take on holiday. Realistically however you don’t have an endless amount of space and you have to draw the line somewhere. Obviously the list is not exhaustive but if you want to find out more about what to take camping then simply visit our more in-depth blog post. Realistically if you’re planning to go camping in France in your own tent, you won’t be getting to France by plane, ferry or train as a foot passenger. In reality you’ll be planning to take your car which will no doubt be filled with all manner of items including your own tent. Therefore if you’re taking your car you’ll be limited to either taking the Eurotunnel or catching a ferry to France. Eurotunnel travels between Folkestone and Calais and takes a mere 35 minutes with up to four departures an hour during peak times. The ease and speed of the Eurotunnel means that you can be in the UK one moment and France the next, ready to head onto your chosen campsite. Although slower, catching a ferry to France can be a brilliant alternative. Ferries are better depending upon where you live and your final destination. There are a number of ports with ferry services to different parts of France. These include Plymouth to Roscoff, Portsmouth to St Malo, Portsmouth to Le Havre, Portsmouth to Cherbourg, Portsmouth to Caen, Poole to Cherbourg, Newhaven to Dieppe, Dover to Dunkirk and of course Dover to Calais. If you want to go camping in France in your own tent then the world is your oyster. You can pretty much travel anywhere in France and find a suitable campsite without searching that hard. To find your perfect campsite simply follow some simple steps. First decide whether you want to go camping in northern France, central France or the south of France. Secondly choose from the coast, countryside or mountains. Step one and two will narrow your search area considerably before you finally focus on the campsites facilities and activities. To find a campsite for your own tent we suggest you take a look at our pitch only campsites page or by clicking the button below. You’ll find a whole range of campsites with lots of facilities and activities to choose from. However, early booking is a must as although there are thousands of campsites they book up very quickly. Wherever you decide to go camping in France in your own tent, we hope this guide has helped.